Day fifty what? Blimey, nearly two months and it’s the first night I thought I might be just too tired to do this. I’ve had my darling mum to stay for over a week, which is great, I’m thrilled she’s made it to 92 and is still mobile and compos mentis, but it means planning and cooking three hot meals a day and carrying them on trays up one or two flights of stairs. But I can’t complain – she used to cook three hot meals a day for me and a lot more besides. 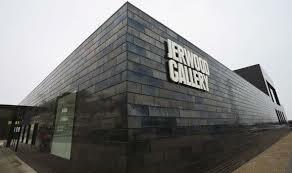 We had lunch out yesterday, at the café in the Jerwood Gallery, here in Hastings, which has just been placed in the top twenty of art gallery restaurants in the UK. It’s well deserved. 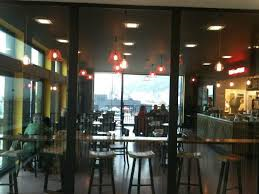 The food is great and it’s quite something knowing the fish comes out of the sea just a few yards down the beach and you can sit looking at the fishing boats which brought it in. 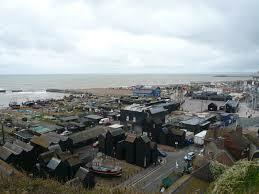 This is the view down onto the Gallery and the fishing fleet, from the end of my street. I love Hastings.